Israel What Really Happened on El Al Flight 002? What Really Happened on El Al Flight 002? Two El Al flights Thursday night left New York en route to Tel Aviv hours late, leaving Shomrei Shabbos passengers in a bind and resulting in heated finger-pointing and conflicting accounts between passengers and airline. The northeastern United States had its first snowstorm of the year Thursday, with far more snowfall than meteorologists had predicted. Flight 002 left JFK at 11:45 p.m. Eastern Time on a snowy Thursday evening, according to data from flightradar24, more than five hours after its scheduled departure time. Flight 008 departed JFK at 12:43 a.m. Friday morning, over two hours late. It was apparent that neither flight would be able to make it to Israel in time for Shabbos. Flight 008 was initially to be diverted to Rome, but as it had a sick patient onboard, El Al received permission from Rishon LeTzion Harav Yitzchak Yosef, shlita, as a matter of pikuach nefesh, to fly straight to Israel, where it landed at 5:35 p.m. Friday evening, nearly an hour after sunset. Flight 002 was diverted to Athens, where the passengers spent a Shabbos hosted by Chabad, before continuing on to Israel late Motzoei Shabbos. But the snowstorm in New York would pale in comparison to the media storm that would soon surround these flights, particularly 002. Two passengers on Flight 002 wrote on social media that religious passengers on the plane, concerned about landing in time for Shabbos, acted violently toward flight attendants and threatened to rush the cockpit. One of the posts also had a video, which showed some voices shouting in a darkened cabin, but no violence. El Al, which has received much negative publicity recently over delayed departures, released a brief statement that did not address the delays in the flights, but referenced the reports of violence, saying it would refer the matter to police. 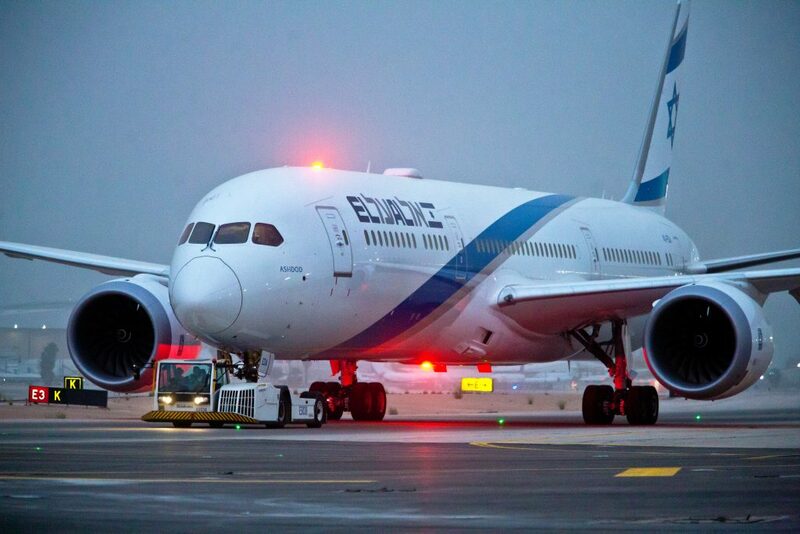 El Al shared with Israeli media outlets the aforementioned social-media posts. But on Motzoei Shabbos, other passengers – including two public figures – released on Israeli media and social media their version of the story of Flight 002, which was sharply at odds with the version publicized by El Al. These passengers stated that there was no violence by any passengers, and that the real reason for the delayed flight was not weather conditions in the airport, but that the flight crew had arrived at JFK three hours late, despite the passengers having been at the gate on time. Multiple Shomrei Shabbos passengers reported having requested that they be allowed to disembark the plane before takeoff, but were refused permission to do so. Just before the plane finally took off, the captain announced that he’d be returning to the terminal if everyone just sat down. So they did sit down – and the captain then headed toward the runway and took off. The captain insisted that the plane would arrive in Israel before Shabbos, and only told them about the diversion to Athens when the plane was near Greece. Yehudah Schlesinger, a reporter for Israel Hayom, wrote on social media that the Israeli media headlines about violent behavior are examples of “incitement,” “poison” and “fake news” against chareidim. According to Schlesinger, one of the passengers who wrote the post about chareidim acting violently, herself was screaming and cursing at the chareidim, who did not react. He also said that a flight attendant grabbed away his camera, and refused to give Schlesinger his name, but when Schlesinger said he was a journalist, the flight attendant immediately apologized and returned it. “I saw the shame of El Al, its fake news, and its huge amount of poison, and I cannot keep silent,” said Schlesinger. According to Schlesinger, the true story is that the delay in departing was because the flight crew had arrived late. “They sat us on the plane and continually told us lies: ‘The flight attendants are already here,’ ‘We’re about to leave,’ ‘We’re first in line,’ ‘We’ll be traveling on a faster route. Three hours on the plane, tons of lies,” said Schlesinger. The captain refused to allow the Shomrei Shabbos to disembark before the plane departed, said Schlesinger, and the captain promised that the flight would arrive in Israel between half-hour and one hour before Shabbos. It was just two hours before they ultimately landed in Athens that the captain announced the diversion to Athens, where the Shomrei Shabbos would disembark for Shabbos, and the secular would continue on to Israel on another (non El-Al) flight. Passenger Keren Fisher, commenting on Dan’s Deals’ social-media page, said that El Al’s press release explaining the incident was a complete falsehood. Fisher also said it was “chutzpah” that the flight that finally took them from Athens to Israel did not depart until 11:30 p.m. Saturday night, more than five hours after Shabbos ended. Keren Levy, another 002 passenger, posted a photo of herself cutting her El Al Frequent Flyer Club card. “It is not a religious vs. secular issue,” she wrote. “The story is a major organizational disaster, which [El Al] is trying to use to create a culture conflict.” She also said that “media outlets are the greatest source of fake news,” and that there have been many such incidents of improper conduct by El Al in the past, only this time, religious reporter Yehuda Schlesinger was there to publicize it. In response to a request for comment from Hamodia on Sunday, an El Al spokesperson said that the company “cannot accept any display of violence in any form,” but did not address the issue of the delays or the allegations by the passengers against the crew. On Sunday evening, El Al released a statement saying that “severe weather in New York caused many delays for hundreds of flights of other airlines,” but “El Al succeeded in having Flight 002 take off from New York for the benefit of our passengers, with a stopover in Athens.” The statement said El Al would not tolerate violence by passengers and would report to the police any passenger who was violent. The airline has still not addressed the passengers’ complaints of dishonesty and misconduct by the crew. If you were on Flight 002 or Flight 008, we’d like to hear from you: What really happened on that flight? Please send us your story, along with your name and a photo of your ticket, to rborchardt@hamodia.com, with the flight number in the subject line.